These photos relate to the long-awaited meeting and visit of Richard T. Krebs of Wayne County, PA (USA) and his "double," Richard Krebs, mayor of Bishbrunn, Lower Fraconia, Bavaria, Germany. The two men happen to share a strong resemblance, age (64) and name. The pictures were taken in Germany earlier this week (June 2012). At the German festival in honor of the Krebs’ meeting in Bischbrunn, are from left, (German) Richard Krebs’ daughter Stefanie, who did the translating; Erhard Krebs, older brother of the mayor; Mayor Richard Krebs (German) and Richard T. Krebs (American). The matching shirts have the Wallenpaupack Lake Estates logo in honor of Richard T. Krebs’ home. 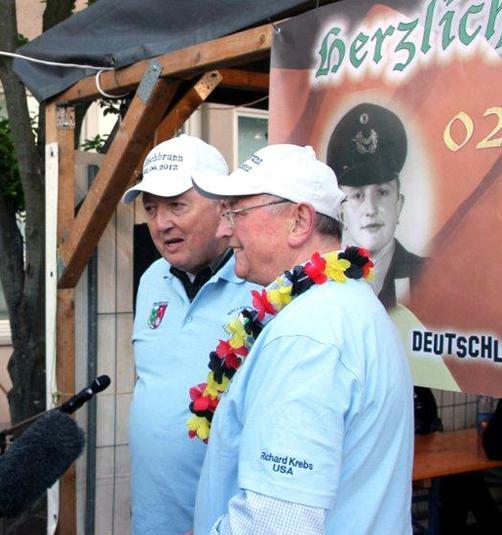 Richard Krebs (German) at left, with his friend Richard Krebs (American), enjoying being the center of attention at a festival in their honor in Bischbrunn, Germany, June 2nd. 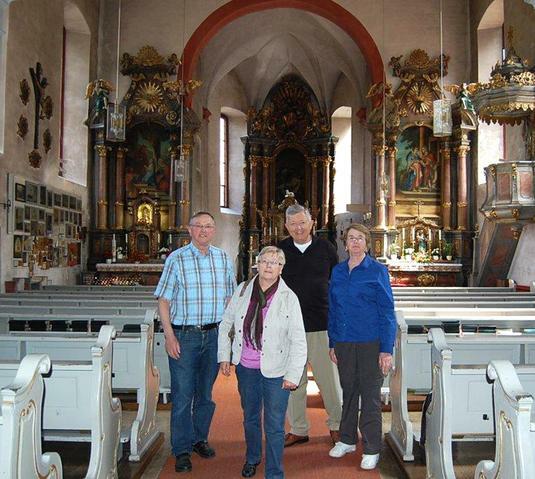 From left: Germans Richard and Ann Krebs and Americans Richard and Kathleen Krebs visit Maria Buchen. 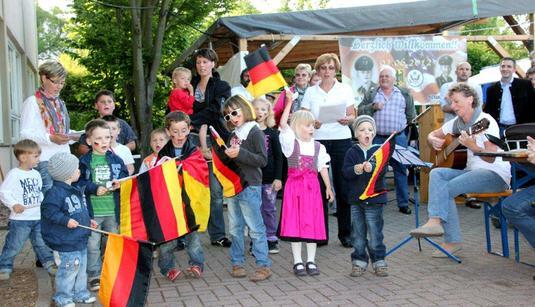 German kindergarten children sang for the two Richard Krebs at the celebration in Bishbrunn. Richard T. Krebs of the US (at left) and Mayor Richard Krebs are shown being interviewed for German media. 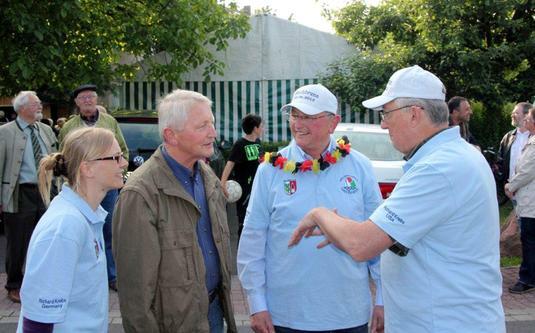 A crowd of well-wishers participate in the community festival honoring the two Richard Krebs in Germany, June 2012. 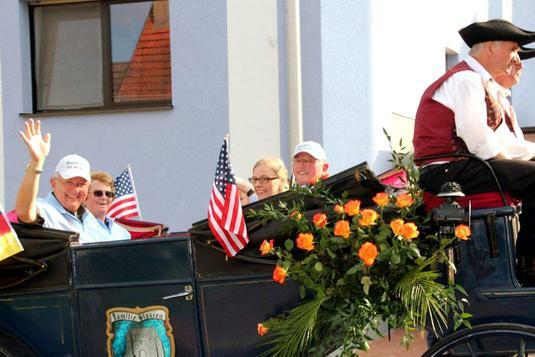 Richard Krebs (US) at left, and Richard Krebs (Germany) at right, with their family members, enjoyed a horse-drawn carraige ride at a community festival in Germany held in owner of the two look-alikes. Krebs (US) is a resident of Wallenpaupack Lake Estates. 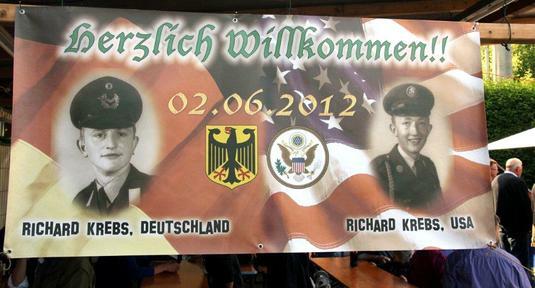 This banner hung at the festival honoring the two Richard Krebs in Bishbrunn. 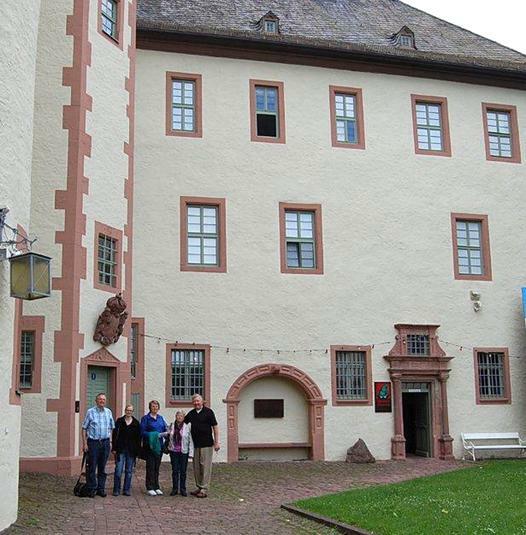 Krebs and Krebs visit Spessart Museum, in the Lohrer castle. 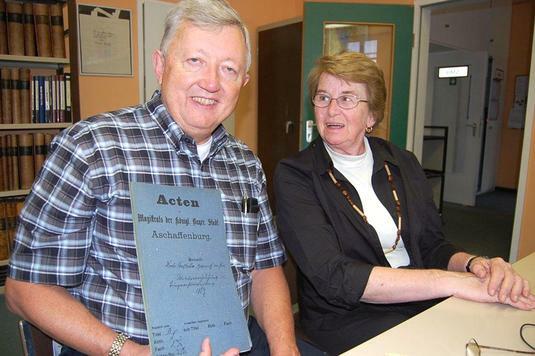 Richard T. Krebs and his wife Kathleen were doing some geneological research at the Archives in Aschaffen castle. 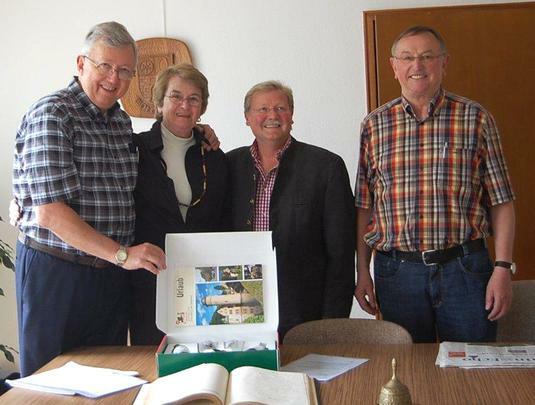 From left are Americans Richard T. and Kathleen Krebs; Herbert Ruppel, mayor of Weibersbrunn; and Richard Krebs, mayor of Bischbrunn. They are studying the archive documents for the municipality of Weibersbrunn. On the wall in the background the coat of arms of municipality Weibersbrunn. 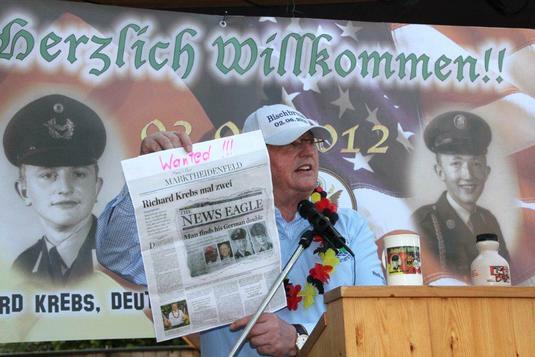 The German Richard Krebs holds up a newspaper from his country showing an image from March 31-April 2 edition of The News Eagle telling the story of the two Krebs. The German headlines literally translates, “Richard Krebs sometimes two.” The banner reads literally, “Pretty welcome! !” Marktheidenfeld is a town in Lower Franconia, Bavaria. 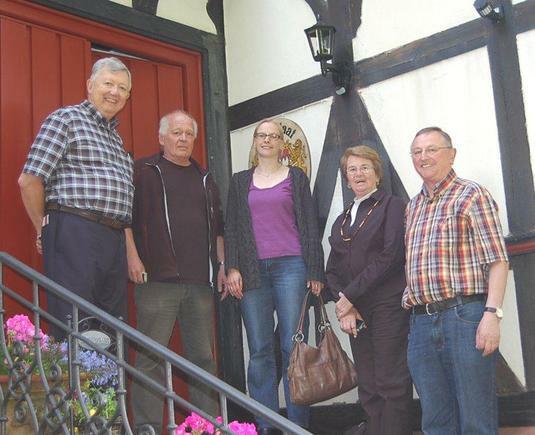 Visiting the historic site of Luitpoldhöhe in Spessart, southwestern Germany, from left are (American) Richard T. Krebs; Georg Taupp, Stefanie Krebs (daughter of the German Richard Krebs); Kathleen Krebbs (wife of Richard T. Krebs and Richard Krebs of Germany.